Poaching: Can Technology Help Prevent Extinction of Kenya's Big Game? To the horror of naturalists and lovers of wild animals, poachers of rhinos, elephants, and other large mammals in East Africa are bringing to their grim work the technology of sophisticated military operations, including night tracking devices and long-range sniper rifles. And they are winning the war. Ivory fetches between $200 and $500 per pound on the black market, while rhino horn, much harder to obtain, can easily bring $12,000 a pound in markets in China and Vietnam. For rewards like these, poachers are willing to train hard, as a military unit would, using assault rifles and night-vision goggles. They develop strong bush skills that make them formidable combatants when confronted by law enforcement. Modern, military-style poachers will not hesitate to kill park rangers who interfere with them. A year ago, in January 2013, Somali poachers working the Kasigau Wildlife Corridor in southeast Kenya fatally shot Wildlife Service Ranger Abdullahi Mohammed. A colleague was shot in the face, but survived with crippling injuries. Kenya's legislators have slowly responded with tough new laws to combat the increasingly militarized poachers. Penalties for killing animals may be made more severe (the maximum punishment a poacher currently faces is a mere 36 months in prison). But more intriguing are proposals to turn technology against sophisticated poachers. For example, Kenya's game wardens announced in October that they will now routinely implant a microchip transponder into every rhinoceros within Kenya's borders. It is thought that only 900 living rhinos still roam Kenya's game parks, down from thousands only decades ago. Ground-up rhino horn is considered a more powerful aphrodisiac than Viagra in many wealthy communities of Southeast Asia, where deluded males believe that drinking powdered rhino horn in their tea will give them massive penile erections. In fact, rhino horn is made of keratin, the same material as comprises human fingernails. Drinking powered rhino horn is thus chemically indistinguishable from drinking pulverized human fingernails. It has no effect whatever on sexual drive. More than 41 tonnes of elephant ivory have been seized in 2013, the largest quantity in 25 years. However, the fact that up to 50,000 elephants a year are now being slaughtered for their ivory seems to have shocked world leaders out of their ennui and into action to halt poaching and ivory trafficking. “Ivory poaching has grown way out of control in recent years, with large scale seizures (those weighing more than 800 kgs) becoming the norm rather than the exception,” said Kelvin Alie, Director of Wildlife Trade for IFAW (International Fund for Animal Welfare). Alie said public demand for action to stop the slaughter and killing of elephants had pressured world leaders into taking action to save elephants. “Wildlife crime ranks among the most serious, dangerous and damaging of international crimes along with human trafficking, drug running and illegal arms sales,” he said. “In the past months we’ve seen an encouraging increase in the numbers of seizures of ivory and more international cooperation to act for elephants than ever before,” he said. Earlier this month delegates to the IUCN African Elephant Summit in Botswana committed to classifying wildlife trafficking as a ‘serious crime’. This unlocks international law enforcement opportunities that will make life that much harder for criminals. Although the number of African elephants killed for their tusks declined slightly last year after worldwide recognition of this wildlife crime epidemic, the rates remain unacceptably high, conservation group WWF says. Data released by the UN shows that an estimated 22,000 elephants were slaughtered by poachers across Africa during 2012, down from the previous year's record of at least 25,000. Central Africa remains the hardest hit with poaching rates twice as high as the continental average, according to analysis conducted on behalf of the 179 members of the Convention on International Trade in Endangered Species. The region has lost nearly two-thirds of its elephant population over the past decade, leaving little time left to reverse its decline. "High level commitments to action against poaching and smuggling are beginning to have an impact, but Central Africa's endangered forest elephants remain in peril," said Lamine Sebogo, WWF's African Elephant Programme Manager. The number of large ivory seizures increased last year – signalling better detection, but also indicating a continued involvement by organised criminal groups. Projections for 2013 are even graver; already this year over 40 tonnes of tusks have been confiscated while in transit. Analysts from TRAFFIC, a joint programme of WWF and IUCN, have also found that smuggling routes are shifting as enforcement is bolstered in some locations. Although global shipping patterns are changing to exploit weaker systems, China remains the top destination for illegal ivory, TRAFFIC found. "Wildlife crime is a serious global security issue and participation by all countries is required to stop it. Improvements are needed in regulation, enforcement, transparency, resourcing and transnational collaboration," Sebogo said. Poaching levels for African elephants have now accelerated to a point where about 25,000 are being killed a year. The population in Africa is projected to decline by 20% in the next decade. This is starting to get people very worried. The illegal trade in elephants has several important features. The first is that there is a separation between final consumers of carvings and poachers who procure the tusks. There is a long supply chain with many parties along the route. And importantly, many of these act strategically. They’re thinking about the future, where demand is going and what effect enforcement is going to have. The second feature is that ivory isn’t consumed in its raw form. It has to be transformed into something of value by carvings. This process isn’t instant. For an elaborate and large carving like a Guangzhou dragon-ball this can take months. The number of skilled carvers is limited and the tools used to carve ivory aren’t sophisticated. There’s a limit to how much can be transformed into carvings. The third feature is that ivory is durable. It can be stored for long periods without deteriorating. This may require some environmental safeguards. In the dry air of Beijing for instance, humidity levels have to be increased. But other than that, tusks can potentially last for years. This is why many governments have stockpiles. Another point is the bad guys have stockpiles too. One way to look at the illegal trade is to break the seizures down into different categories. Seizure data has been accumulated globally as part of the ETIS since 1996. While the weight of seizures is often aggregated, this masks some important differences. Some guy smuggling a small piece of raw ivory in his suitcase, isn’t the same as the criminal conspiracy shipping four tons of tusks in a container. 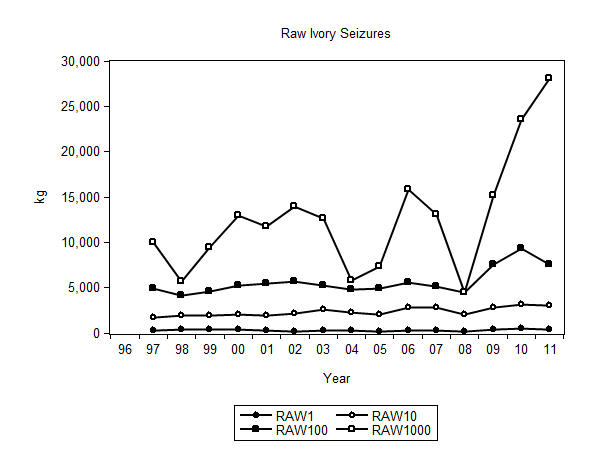 What I’ve done here is taken the ETIS seizure data for raw ivory (by weight) and divided it into four categories. These are the seizures up to less than 10kg (Raw1), the seizures from 10kg but less than 100 (Raw2), the seizures from 100kg but less than 1000, and the seizures that are more than 1000kg. This isn’t the total amount of ivory being illegal trafficked. It is a sample based on seizures. I’ve also expressed the data as a two-year moving average to iron out a little volatility. As the slaughter of the remaining elephants in Africa continues without interruption, elephants in Vietnam—without media attention and a pack of NGOs calling for their protection—are quietly disappearing. Victim of an intensely and increasingly fragmented habitat, weak environmental laws, human-elephant conflicts, logging, and poaching, elephants in Vietnam are teetering on extinction. According to some reports, there were approximately 1,500 to 2,000 elephants in 1980. Today they may number as few as 70. According to Cao Thi Ly, head of the Department of Forest Resource and Environment Management (FREM) at Tay Nguyen University in Vietnam, elephants live in eight or nine patches of forest around the country, including on the borders of Laos and Cambodia. According to a 2012 report by Ly, Vietnam’s remaining elephants are extremely isolated. In some provinces, such as Nghe An, six to ten elephants roam on one piece of land. In other provinces, Son La or Lam Dong, for instance, there are even fewer: only one or two individuals. Their habitat is highly fragmented, and few, if any, corridors connect these patches. Although the number of African elephants killed for their tusks declined slightly last year after worldwide recognition of the severity of the wildlife crime epidemic, the rates remain unacceptably high, conservation group WWF says. UN data released today shows that an estimated 22,000 elephants were slaughtered by poachers across Africa in 2012, down from the previous year’s record of at least 25,000. Central Africa remains the hardest hit with poaching rates twice as high as the continental average, according to analysis conducted on behalf of the 179 members of the Convention on International Trade in Endangered Species. Scientists say the region has lost nearly two-thirds of its elephant population over the past decade, leaving little time left to reverse its decline. “High level commitments to action against poaching and smuggling are beginning to have an impact, but Central Africa’s endangered forest elephants remain in peril,” said Lamine Sebogo, WWF International’s African Elephant Programme Manager. The number of large ivory seizures increased last year signalling better detection, but also indicating a continued involvement by organized criminal groups. Projections for 2013 are even graver; already this year over 40 tonnes of tusks have been confiscated while in transit. “Wildlife crime is a serious global security issue and participation by all countries is required to stop it. In many places improvements are needed in regulation, enforcement, transparency, resourcing and transnational collaboration,” Sebogo said. Governments are meeting this week at back-to-back summits in Botswana and Paris to agree emergency activities to protect elephants from poaching and trafficking, and to discuss the peace and security implications of this transnational crime. WWF is urging nations to adopt the Marrakech Declaration, a ten point action plan to combat illicit wildlife trafficking launched by the African Development Bank and WWF in May. WildlifeDirect has been studying the conclusion of wildlife crime cases at Nairobi's Makadara court which handles all arrests made at the Jomo Kenyatta International Airport. Already this year there have been at least 45 arrests. Out of 45 arrests 84% were offenders of nationalities from the Far East (42% were Chinese, and 39% Vietnamese, another 11% Thai and 2% from Laos). 41 of the offenders, or 93%, had ivory. Six individuals had ivory and lion claws, two had snake skin. One Vietnamese man had 5 rhino horns. Apart from one case where the file was incomplete, all of the offenders pleaded guilty. Earlier this year WildlifeDirect began drawing attention to the release of offenders at Makadara court on petty fines when the current law actually allows for up to 10 years for offences against elephant and rhino or trafficking in their products. Things seemed to turn around when Chinese woman Chen Bie Mei was arrested at JKIA with 6.8 kg of ivory packaged as macadamia nuts, she pleaded guilty and to her surprise was jailed for 2 years 7 months on August 15th. Kenyans celebrated, they thought that things had changed. However, our follow-up research shows hat this was a rare occurrence. In fact, only 3 people have been sent to jail for crimes against elephants and rhino at Makadara court this year. That's less than 7% - ie if you are caught with ivory or rhino horn at JKIA, the probability of going to jail is less than 1 in 12. This is surprising given the economic impact of the slaughter of elephants and rhino, especially in light of the fact that the Wildlife Conservation and Management Act, Cap 376 for 10 years in jail for offenses involving elephant, rhino and lion. When representatives from African elephant range countries and conservation experts are set to meet in Botswana next week to discuss the future of African elephant, Tanzania is in dilemma over the sale of tons of ivory stockpile stored in the capital city of Dar es Salaam. To address the escalating poaching of African elephants, the International Union of Nature Conservation (IUCN) has convened a meeting in Gaborone, Botswana, from 2nd to 4th December this year and which will be opened by Botswana president, Ian Seretse Khama. It is expected that some African Heads of State will attend the meeting, parallel with key conservationists from donor states. But, the Tanzanian government is in dilemma over a bid to sale its 137 tons ivory stockpile, worth over US$ 80 million, and stored in a tight security Ivory Room in Dar es Salaam. The government is lobbying to the Convention on International Trade in Endangered Species (CITES) Secretariat to allow this African elephant range state to sale its ivory stockpile. Tanzanian minister for Natural Resources and Tourism Mr. Khamis Kagasheki said this week that a prompt decision by CITES will enable Tanzania to dispose its huge ivory stockpile to raise more funds for conservation wildlife. A bid to sale the ivory stockpile flopped in 2010 during the CITES Conference of parties which met in Doha, Qatar where the Tanzanian government submitted its proposal to sale the ivory lot. Tanzania wanted to sell the ivory to trading partners that have been already designated by the CITES Standing Committee, as having sufficient national legislation and domestic trade controls to ensure that the imported ivory will not be re-exported and will be managed in accordance with CITES requirements concerning domestic manufacturing and trade. Tanzania is persuading the Convention on International Trade in Endangered Species (CITES) Secretariat to speed up its decision-making mechanism for future ivory trade transactions. Natural Resources and Tourism Minister, Ambassador Khamis Kagasheki, said when opening the two-day multistakeholder's meeting on illegal wildlife trade in Dar es Salaam, that a prompt decision by CITES will enable Tanzania to dispose of the huge ivory stockpile currently in the stores. He, however, acknowledged that the current situation and rate of elephant poaching might generate heated debates on whether to ban or not to ban trade in ivory. Amb. Kagasheki explained that the recent ivory seizures have added to the already swelling stockpiles of elephant tusks without disclosing the amount of ivory stockpile that the country has. The government recently intercepted in Zanzibar what it has described as the largest consignment of ivory in Sub-Saharan Africa. The minister noted that if granted permission to sell the consignment, the money would go towards supporting elephant conservation efforts, as well as communities which pay the price of coexisting with elephants around protected areas. "We believe discussions will lead to a good understanding on what to do with that kind of ivory stockpile that we have. On one hand, we have the stockpile and on the other hand, our Jumbo is getting butchered... this poses a great challenge," Amb. Kagasheki noted. He added that government efforts in the anti-poaching fight is facing a myriad of challenges, including insufficient funds to curb poaching, inadequate awareness of environmental crime among law enforcing agencies, lucrative illegal markets for ivory in Asian countries, increasing sophistication of communication in poaching syndicates, corruption and lack of political will to support anti- poaching efforts. "We need the necessary political will in the anti- poaching drive, so that we can all move positively forward and record great achievement," he explained. He added that the government has not abandoned the special operation dubbed 'Operation Tokomeza'. Last week US officials grabbed headlines after destroying over five tonnes of illegal ivory, seized over the last 25 years since the global ban on ivory trade was implemented in 1989. The stockpile was said to be worth over £6bn and was estimated to have been the equivalent of around 2,000 adult elephants. In 2012 alone over 35,000 elephants were killed for ivory demonstrating the extent of the problem that poaching has become. In the past, much of the demand came from South East Asian countries such as Malaysia and the Philippines for use in ornamental daggers. However, in recent times, much of the blame has fallen to China, Japan and Thailand, with the demand for illegal ivory doubling since 2007. In these countries ivory is used for a number of ceremonial and religious purposes as well as in traditional medicine. Large numbers of people still hold true to ivory’s supposed aphrodisiac properties. Over 40 per cent of illegal ivory is believed to end up in Japan, often passing through Hong Kong. In one arrest last month over 700kg of ivory was seized by Hong Kong customs. Big steps have been made in the effort to tackle the ever-growing problem of ivory poaching. Numerous anti-poaching sections have been introduced into game reserves across Africa as well as funding from organisations such as Google, who in 2012 donated $5 million to the WWF to improve the methods already in place, such as remote aerial survey systems and wildlife tagging technology. On top of this, education programmes have been implemented and punishment for poaching has become more rigorous. However, the incentives for poaching are still vast. A poacher can make $2,000 from a small set of tusks, which is more than they would earn from two to three years of work. Despite best efforts in Africa and the West, we are seeing little to suggest that we are any closer to a solution. With the number of wild elephants now at only 400,000, if poaching continues at the current rate, extinction could be on the horizon within the next 10 years. As we have seen in the US this week, the destroying of large stockpiles of ivory is a symbolic gesture to promote the fight against the illegal ivory trade. But will this gesture reach the countries demanding ivory such as China? Maybe there needs to be more emphasis on targeting the countries buying the ivory rather than those supplying it. Just last year, Yao Ming, a Chinese ex NBA star was involved in the launch of a major public awareness campaign targeting the consumption of ivory and rhino horn in China. This proved successful in a previous campaign where Ming was credited with the reduction of shark fin consumption in China by 50-70 per cent. Shark fin soup was removed from the menu at all state banquets following the campaign. This admirable example raises the question that rather than focusing the majority of efforts on combating ivory poaching at its source; should we be putting more emphasis on targeting the South East Asian market where the demand for ivory is coming from? The fight between the government and elephant poachers appears to be an amusing battle, but one that the culprits appear to be winning hands down to the chagrin of the nation's younger generation. It is a skirmish raging in the country's jungles, across rivers and lakes to the streets of urban centres, mostly in the highways and alleys of the country's commercial centre of Dar es Salaam and right across the Indian Ocean to the capitals of Tanzania's chief international trade partners in the East. Indeed, a war it is that is marked by amazing scenes. Such a spectacle as East African governments and Tanzania in particular are having in their frantic fight against poachers make the fight even more humorous. But the humour does not take away the pain destined to hurt the country for a long time to come. It is a pain that is cutting deep into the very economic jugular vein of the nation while some people in positions of power and who could stop it, sip tea with a half cake in air conditioned offices or a five-star hotel by the seaside. In 2010, Tanzania seized a 90-tonne stockpile of ivory it from poachers in the country. The size of the pile alone shows how determined poachers are and the sure way the tuskers' community is going - extinction. That ivory stockpile was what the government had for the previous over three decades seized from various sources. Somehow, sometime the government had also intervened more illegal ivory. More of the trophy had likewise been handed over to the authorities. In the end, the government found itself with a stockpile of ivory it thought best to sell as the only way to make up for the tourist loss to some extent. Kenya criticized the move as potentially encouraging to poachers, who would consider buyers of that illegal trophy a sure market. Incidentally, the north-eastern neighbour of Tanzania had likewise found itself with such a stockpile but eliminated it otherwise. In the late 1980s, the then Kenyan President Daniel arap Moi torched tens of hundreds of tonnes of ivory tusks, whose value was then estimated at $1 million, in an official gesture of commitment to eradicating elephant poaching. Then again, sometime in July 2011 Kenya's President Mwai Kibaki set on fire nearly five tonnes of ivory worth of $16 million. If you thought that Westgate Mall siege by Al-Shabaab gunmen who killed at least 67 people in September in Nairobi, Kenya, would be a lesson for managers and owners of malls in Tanzania to increase security, you are dead wrong. The best known mall in Dar es Salaam, Mlimani City, for a few days after the siege introduced security checks and afterwards it was back to business as usual. It was reported that the inspections made the number of customers decrease tremendously, and were called off. Go to the rest of the malls in the country’s business capital, there are no security checks at all. Yet, the police have caught up with suspected Al-Shabaab trainees in Mtwara and Tanga after the Nairobi attack. The Tanga story is extremely sad; it was reported that about 70 suspects, including children as young as 4 years of age, were caught being indoctrinated in Al-Shabaab ideologies. Who knows if those kids at the end of the day could have been used as suicide bombers? What terrorist activities were the Al-Shabaab recruits being prepared for? Would they have operated in Tanzania or outside Tanzania? Who is recruiting and hosting them? The public was left with more questions than answers.There is cause to fear that terrorists could be preparing to make headway into our motherland. The police have done commendable job in Mtwara and Tanga cases, but is it enough? What about other regions? Looking back-in 2011, there were media reports linking Al-Shabaab terrorism with poaching in the case of Kenya. Poaching and seizure of ivory consignments has almost become a street song with its chorus punctuated by yet another report of confiscation of the government trophies from peddlers. Earlier this month, President Jakaya Kikwete addressed the nation through the National Assembly in Dodoma expressing strong commitment by the government to stop poaching. The seriousness of the crime that the president was talking about could best be attested by the available statistical data of the volume of the load so far impounded at the expense of the word's inheritance. For example, in the recent past, the jumbo tusks weighing 2,915 kilogrammes valued at Sh7.5bn/- were impounded at Malindi Port in Zanzibar packed and camouflaged as seashells. Local wildlife reports indicate that poachers kill elephants at the tune of 30 animals every day. The number has dropped from 130,000 elephants in 2002 to 109,000 in 2009. Unless brought under control, it is estimated that poaching would wipe out elephants and rhinos in the next seven years. Africa is home to an estimated 472,000 elephants, whose survival has come under serious threat by poaching and systematic destruction of the animals' habitat. Two facts about poaching cannot be denied; the endangered species are classified among other global cultural heritage entities and therefore should be accorded deserving concerted efforts to reinforce protection. Secondly, the operatives behind the illegal transaction based in countries of origin are globally (internationally) connected to facilitate communication with their cohorts in countries of destination. A historic huge ivory haul has been intercepted at the Zanzibar harbour in a 40-foot shipping container ready for transportation to China - the main destination suspected. Two people--a clearing and forwarding agent and a businessman - who are responsible for the consignment--were arrested in connection with the contraband of more than 1,000 pieces of elephant tusks. Both suspects have, however, denied knowledge of the ivory which was concealed in bags full of seashells. The ivory pieces were wrapped in sacks, then stuffed in the middle of the seashells in the 100-kilo bags and arranged at the back of the container. A Minister of State in the President's Office, Special Department (paramilitary), Mr Khaji Omari Kheri, said that everyone involved will be brought to justice. He said that the Union and the Zanzibar governments will not allow such illegal activities to take place on the Mainland or Zanzibar, otherwise all the elephants in the Mainland will be wiped out. "Using Zanzibar as the point of departure shows that the culprits are now changing the techniques of shipping. Both governments will not allow this to happen. We will start dealing with everyone involved," Minister Kheri said. The seizure of the consignment follows a tip-off that the Minister for Natural Resources and Tourism, Amb. Khamis Kagasheki received. This prompted him to fly to Zanzibar where the container was seized. Amb. Kagasheki expressed appreciation for the good cooperation shown by the Zanzibar government and the Commissioner of Police, Mr Mussa Mussa, who supervised the offloading of the ivory from the 40-foot container.